In 1980, at the age of 21, I successfully applied for a nursing assistant job on an acute-admission ward at the local District General Hospital. Eager to learn, and harbouring a heady mix of excitement and apprehension, I donned my white tunic, decorated on each shoulder with a brown epaulette, and stumbled into the surreal environment of the mentally ill and their professional guardians. Thirty-three years later I opted for early retirement from the National Health Service, so ending a long and turbulent relationship with the murky world of psychiatry. My first role as a nursing assistant allowed me to observe and interact with an assortment of deeply troubled people who psychiatry had defined as mentally ill. The middle-aged lady with ‘schizophrenia’ and a piercing stare who spent much of each day sitting alone in the corner of a quiet room, her incoherent mumblings punctuated only by shouts of ‘piss off’, directed at anyone who ventured into the three-yard virtual exclusion zone that she had erected around herself. The 60-year-old ‘manic depressive’ with constant dribbles of spittle seeping out of the corners of his mouth, on an unrelenting mission to dismantle every bed in the dormitory so he could reconstruct them to his own superior design. And the young woman pacing the ward corridor, avoiding the cracks between the floor tiles and counting in multiples of seven, engrossed in her ‘obsessive-compulsive’ efforts to prevent harm befalling her loved ones. At 21, and armed with my recently completed biochemistry degree, I willingly bought into the notion that these oddities of behaviour and emotion were the products of a brain illness. After 12 months as a nursing assistant, I left to pursue psychiatric-nurse training at a large hospital (Prestwich, near Manchester) that had, at the beginning of the 20th century, been recognised as the biggest asylum in Europe. During the first six weeks of training I learnt essential nursing tasks, like how to read a medication prescription card as well as practising my injection technique on oranges (as a prelude to human beings). Throughout this initial phase of my relationship with psychiatry, I colluded with the traditional ‘illness like any other’ practises. During my six years in nursing I poured out copious quantities of chlorpromazine syrup, (at the time referred to as a major tranquilliser but later regarded, somewhat misleadingly, as an ‘antipsychotic’ drug), routinely syringed oily liquids known as depots into the rumps of the inmates, and assisted with electroconvulsive therapy (ECT) involving electrocution of the brain to produce a seizure – an event that would necessitate a visit to the Accident and Emergency Department if it occurred in any other setting. I’m not proud of my behaviour during this phase of complicity with biological psychiatry. I did, however, learn a lot about human suffering and misery. Despite administering treatments consistent with the assumption that mental health problems are the direct result of a brain defect, I harboured embryonic ideas about alternative ways of responding to distress. Keen to learn more about non-medical approaches to mental health problems, I left nursing in 1987 to train as a clinical psychologist and entered the second phase of my relationship with psychiatry which could be described as ‘seeking change from within’. During the 1990s I developed the skills to deliver talking therapies and offered these approaches within the psychology silo, a sort of parallel world to the dominant psychiatric method of diagnosis, medication and mental state monitoring. I and like-minded colleagues tried to liaise with, and nurture, the pockets of innovative practice scattered across the psychiatric arena. 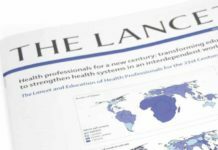 At this time I believed that enduring improvement in psychiatric services – the achievement of a response to human suffering that was optimistic, respectful, empowering and helpful – could be achieved within the existing system. But I was frustrated by the speed of change, slow at best and often unsustainable. My psychology colleagues urged patience, advising me to seek ‘evolution not revolution’. By the turn of the century my disillusionment deepened and I entered my third, and final, career phase: the recognition of the need for a paradigm shift, a revolution. Conflicts with psychiatrists, managers and some senior nurses became commonplace. 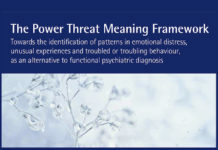 I was saddened to witness the efforts of some committed individuals (from a range of disciplines) struggling to promote more humane, person-centred practices only for them to be ultimately defeated by a medical culture dominated by the assumption that mental health problems were the products of brain diseases and required hefty medication regimes to resolve them. Any innovative practices – recovery-orientated approaches, normalising interventions for voice hearers, service-user involvement in staff training – would ultimately be crushed when the mental health services were under financial pressures, the regime instinctively defaulting to the damaging ‘illness like any other’ approach where the expectation was for the patient to swallow chemicals and follow expert instruction. Those staff who did try to promote more psycho-social practices sometimes buckled under the pressure of unrelenting opposition, as indicated by the deterioration in their own mental health or by the development of a hardened, non-compassionate shell that mirrored the management style of their superiors. As one might expect from an institution ideally tailored to deliver treatments for physical illnesses like cancer and heart disease, NHS-led psychiatric services remain wedded to medical model assumptions: disorders labelled as ‘schizophrenia’, ‘bipolar disorder’ and ‘major depression’ are brain diseases; medical specialists possess the appropriate expertise to lead service planning and delivery; and any psycho-social initiatives might help around the edges of the ‘disorder’, but will always be an optional add-on to medication. During the final years of my career in NHS psychiatry, 2009 to 2013, I witnessed many absurdities, including: a senior management team determined to axe an innovative ‘early-intervention for psychosis’ service primarily because the values and philosophy of the team did not correspond to those of the lead psychiatrists; managers feeling so threatened and disempowered that no one was willing to make a decision as to whether a service user could engage in four hours per week of voluntary work alongside the hospital caretaker; the insistence of senior managers that all staff on a new (and supposedly innovative) psychiatric rehabilitation unit should wear the same uniform as their counterparts on the medical wards; and psychiatric professionals refusing to participate in a mindfulness-training group alongside service users because of concerns about showing their charges that they, too, might sometimes feel stressed and vulnerable. Thirty-three years continuous service provided the opportunity for me to opt out by taking early retirement, aged 55, and escape from the fundamentally flawed and pernicious psychiatric arena. 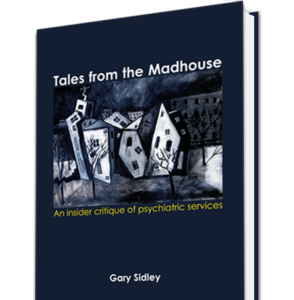 Subsequently, I have written a book based on my experiences – Tales from the Madhouse: An insider critique of psychiatric services – a project that has provided the opportunity to express the nonsense and injustices endemic within professional psychiatry. As well as being cathartic, I hope the book can make a contribution to the emerging protests about the way Western societies make sense of human suffering. Despite my experiences, I remain hopeful. The array of dissenting voices against traditional psychiatry has never been more compelling. The next five to ten years offers an exceptional opportunity to transform the way we, as a society, respond to mental health problems. And as I state in the last sentence of my book, ‘The prize of a more compassionate and effective response to human suffering could not be more worthy’. Gary is a freelance writer, blogger, conference speaker and trainer. In 2013, he opted for early retirement from his post of Professional Lead/Consultant Clinical Psychologist after 33 continuous years of employment in NHS mental health services. Throughout his career, Gary has presented numerous workshops on a range of topics including: the psychological factors underpinning suicidal behaviour, stigma, advance decisions, cognitive behaviour therapy and the limitations of risk assessment. He writes on a range of topics, including: alternatives to biological psychiatry (his book, Tales from the Madhouse: An insider critique of psychiatric services was published by PCCS Books in February 2015); general interest articles and humour. Gary is also a moderator of the ‘Drop the Disorder!’ Facebook group. Thanks for your article Gary. I’m from NZ but my introduction to working in psychiatry in the UK was at Prestwich hospital back in 1989. I found it a scary place and as an Occupational Therapist (OT) was totally out opinionated by medical and nursing staff. I saw some atrocious behaviour by nursing staff. I worked as a clinician for over 20 years but always on the back foot as an OT who still gets referred to as a basket maker. I thought I was holistic and getting a label of Bipolar one disorder did buy into the medical model due to the fact that I couldn’t really make sense of it as I don’t have much of a trauma history (I did go manic 2 weeks after a miscarriage though). Social workers and psychologists were always my allies when trying to speak up for people and what change was needed. 7 years ago I left clinical work for poorly paid, peer support work after being totally burnt out. This opened up the doors for a whole new set of reading and discovery into how sucked in I was to it I was, even though I worked from the belief that having good OT input and being trained in talking therapies, was good at my job. The trauma I have suffered as an inpatient on the 3 occasions it has happened is as bad, if not worse than other trauma I have had in my life. I now believe the only way we can truly have a paradigm shift is to remove psychiatrists from the top of the hierarchy of mental health services. After all mental health means being mentally healthy not mentally ill. It saddens me that I don’t think this will ever happen and I continue on a daily basis to see the trauma caused by psychiatry with there so called “antipsychotics and their belief that this is what they are rather than major tranquilizers or neuroleptics that they were called before big pharma re-branded them. I believe all psychiatrists and junior doctors training in this field should be forced to take them and deal with the horrendous side effects they cause. The horrendous traumatizing hallucinations I had from them, which they doctors put down to “mania” might just make them think twice before prescribing them. Nevip, I appreciate your interest and taking the time to read and leave a comment. It sounds like your experiences within core psychiatric services correspond closely to my own. When the pace of change is so slow, I can identify with the frustration and (at times) helplessness. I urge you not to give up but to keep on telling it like it is. Take care. thank you for your article. It is thanks to people like you that people like me manage to survive the system, and as I continue arguing on my blog (as well as on Mad in America website), the problem lies in the system itself. However, I personally think that it is not at the level of psychiatry but at the level of sociology, such as in the definition of ‘mental illness’ as such. Some people genuinely become ill and do need a secure place to stay, such as a psychiatric hospital, but the problem is that everyone who comes there is being treated in the same way. I have a diagnosis shared by mass-murderers and genuinely bad people. Psychiatry isn’t going anywhere, but it is the contribution from other people and professions which is urgently needed, as well as a more human approach to spiritual malaise. The problem lies in recognizing what is spiritual malaise, personality struggle or illness, and in treating each patient individually and not as a mass fabric put under the same diagnosis which then requires the same treatment. But I know some people whose lives were saved thanks to electro-shock (extreme depression) or lithium. I also think that the biggest problem is in defining ‘mental illness’ and in putting all manifestations of ‘outside’ normality in the same box. Thanks for taking the time to read and comment. I believe the problem is indeed psychiatry and their ‘illness like any other’ approach to human distress. Nor do I accept that psychiatric drugs and ECT save lives. There are clearly some people who find psychiatric drugs helpful and some who claim to have gained benefit from ECT. But there are many more who report being harmed and damaged by these so-called ‘treatments’. So I think we’ll have to agree to differ on those points. When I attempted with permission to come off “medication” abruptly in Ireland (35 years ago) – and failed, I ended up in hospital. I got talking to a Psychologist while I was in there, and he guaranteed me that everyone could make Full Recovery without “medication”, and with the help of Psychology. Totally agree – a quick dip into Twitter would testify to that. In particular a lot of psychologists are into ‘internal defect’ explanations of human distress, as well as colluding with diagnostic approaches. Your article sounds interesting, but I’m struggling to access it. Thanks, Kev – I enjoyed your article; humorous but made valid points. I suspect we’ve worked in similar environments. We need more people to talk honestly about the system we work in – sadly self interest makes this hard to do until maybe more freedom to act comes with retirement etc and often by that time people are just too tired to bother – so thank you Gary for making this effort and for the book. Talking to people labelled as mentally ill or their families can be like running into a brick wall – it is easy to see the sheer power of the label and how it has profoundly shaped peoples beliefs about suffering, its causes and what is to be done. It seems no matter what happens to the person after the label has been applied all distressing life events are forever understood as a ‘trigger’ to (insert disorder here) – relationship breakdown causing suffering, it’s a trigger to bi polar, job that’s slowly killing you causing suffering on many levels it’s a trigger to bi polar, massive debts suffocating you and causing suffering it’s a trigger to bi polar, benefits sanctioned again in a trigger to bi polar and on and on. It doesn’t matter what it is once labelled the person and those around them have been conditioned to see it all through the lens of a disorder – this is also helped along by the many perverse incentives such as people’s desperate need for a little financial help in the form of benefits or so that the increasingly punitive company sickness policy might allow a little breathing space if it falls under the equality act. Ethan Watter in his book crazy like us comments on how once a disorder has been packaged and sold in to the culture and its ‘symptoms’ enter what he called the cultural ‘symptoms pool’ that people are encouraged to self-identify with this story. In our rushed, stressed and ultimately toxic cultures it makes sense that people will automatically default to the ‘professional’ story they have been told by a so called expert. It seems to help us all avoid or distract from the reality that what we need to do is to talk openly and honestly about the many cultural disorders before us and seek collective change to make the world less harmful than it clearly is. For example where is the national debate on the back of the massive Gallup poling covering millions of people in hundreds of countries telling us what we knew anyway – that most people are either profoundly bored/stressed/dulled by their jobs and many actively hate what they are forced into doing each day for work. Unfortunately looking honestly at reality seems just too much to cope with for the millions of people hanging by their own ever thinning threads trying to keep it together in the face of the vast powers of ideology, economy, media, class and the ‘experts’ in mental (ill) health. How do we create the spaces and resources needed to come together collectively to support each other in the very difficult task of looking at what is wrong in the culture and seeking change? 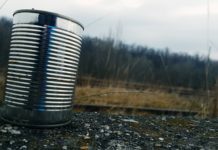 MrMr – I totally agree with you regarding how a diagnostic label can selectively filter and distort future perceptions so that a range of normal human behaviours are viewed as further evidence for the assumed ‘disorder’ – I’ve seen this happen so many times when I worked in core psychiatric services. Thank you for taking the time to read my story and to comment. I am pleased to hear that you found an approach that worked for you and that you were able to come off the depot injection. I wish you ongoing success in managing your anxiety. In comparison to the Anxiety of Neuroleptic Withdrawal Syndrome, today’s anxiety – is a doddle. G/Day Gary, liked your introduction to this critique of Western Psychiatry, and like you, my first introduction to the diagnostic system of medical opinion masquerading as knowledge was in 1980 when I diagnosed as having schizophrenia within 15 minutes of my contact with a practicing psychiatrist. The funny thing about that medical opinion was that I steamed the letter of referral open the night before that fateful day and deciphered the word schizophrenia, in the strangely hard to read, handwriting of referring doctor. So well I am versed in the, “our rhetoric is a solid sense of reality” opinions of well-educated people like doctors and politicians. Well versed too in the experience of experience that you describe so well. My first introduction to MH was in 1980 as well, in the Maudsley Hospital, and to be honest I couldn’t see anyone there that ‘appeared’ Mentally Ill to me, even though they described themselves as Schizophrenic and Manic Depressive. I was sure the idea of ‘medication’ and ‘Chemical Imbalances in the Brain’ were complete rubbish. In the ‘Power of Now’ Eckhart Tolle describes human beings as having a ‘store’ of unprocessed grief which he calls the ‘Pain Body’ which lingers in most people’s backgrounds, but under stress can come to the surface and completely hijack the person. He recommends that a person observe the ‘Pain Body’ until it softens – But that this must be done – before the ‘Pain Body’ takes over. In my experience Eckhart Tolles interpretation – when its put into practice, can be very effective (- for anxiety). My experience is that once the ‘Pain Body’ is softenened, then there is nothing more to worry about, just situations that might need attention. Another problem Eckhart Tolle identifies in the ‘Power Of Now’, is that some people are in the ‘Pain Body’ all the time, and don’t realise it. But once they discover this, and do something abot it, they can find the same peace of mind, as anyone else. This might sound very simplistic but a lot of people’s would attest that it works but it does take practice. The ‘Power of Now’ is a recent read for me. I was able to get an idea of how my anxiety worked years ago when I came off my Long Acting Depot Injection in 1984, and was in danger of going MAD.